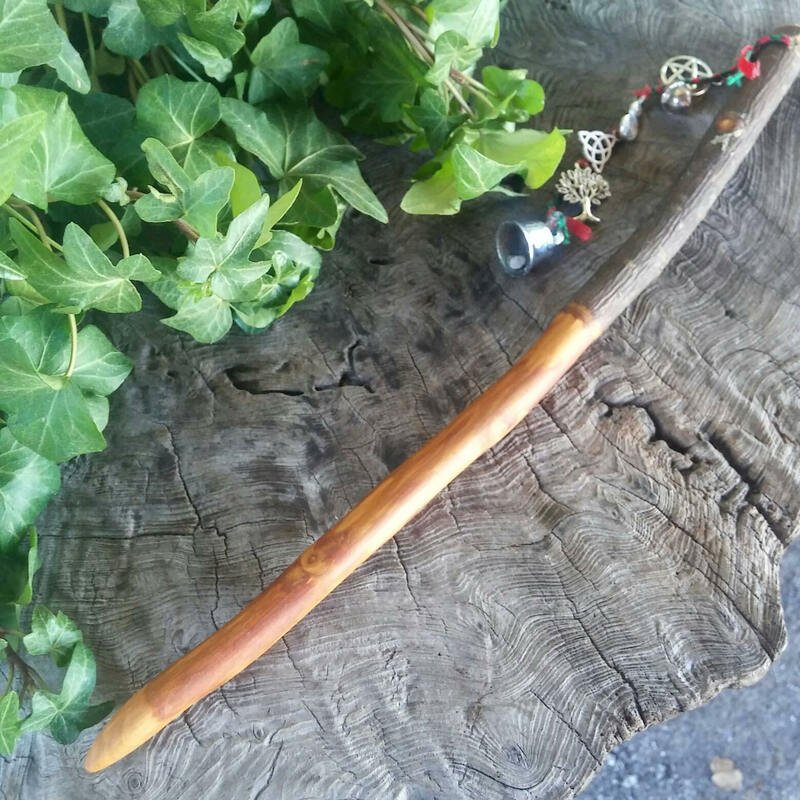 This is a Druid Apple wand, created to honour the Druids and Bard as well as to honour Shamans of the past and of today. The Apple tree is sacred to Druids. The Druids of the past used the Apple magic wand differently in the past than we do in witchcraft as you can read below. 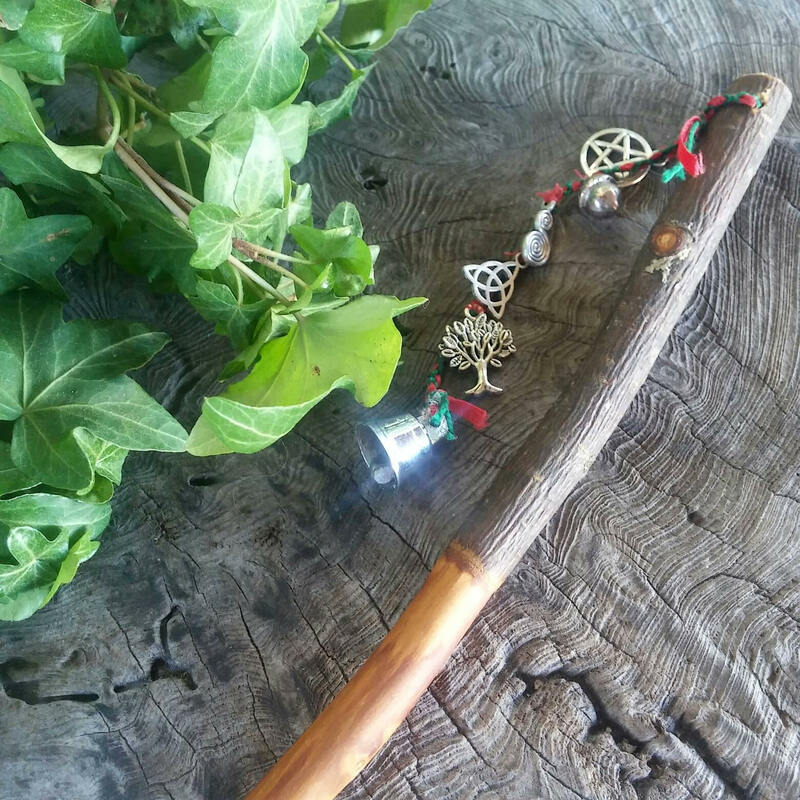 Apple wands are the perfect occult tools to invoke any of the Gods or Goddesses associated with it. If you are particularly attracted to a speciﬁc God/dess, put aside your apple wand to be used only in invoking that deity. 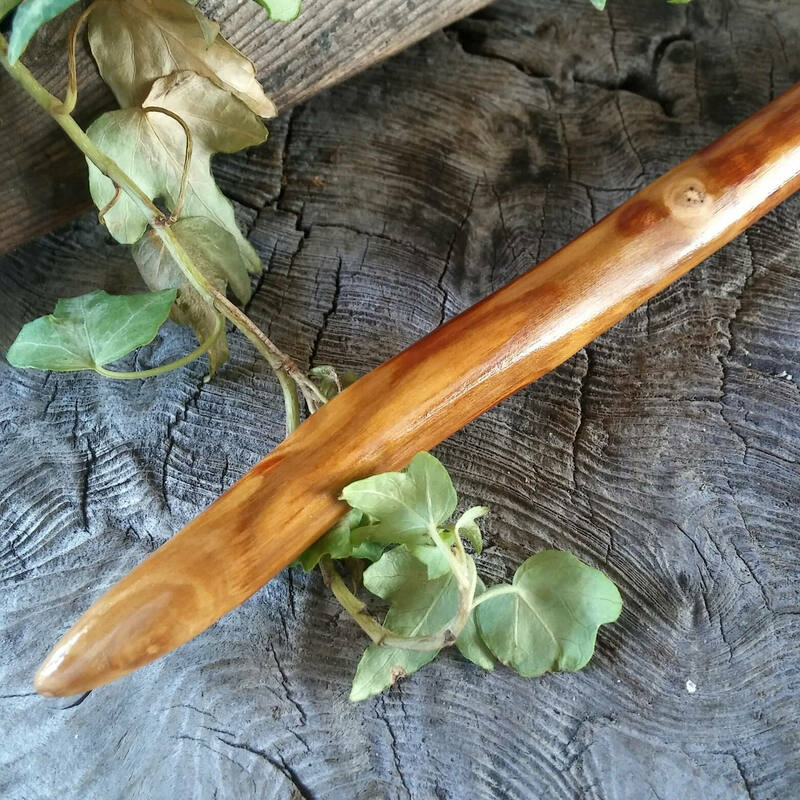 It is a beautiful wood wand that will serve you well in ritual. 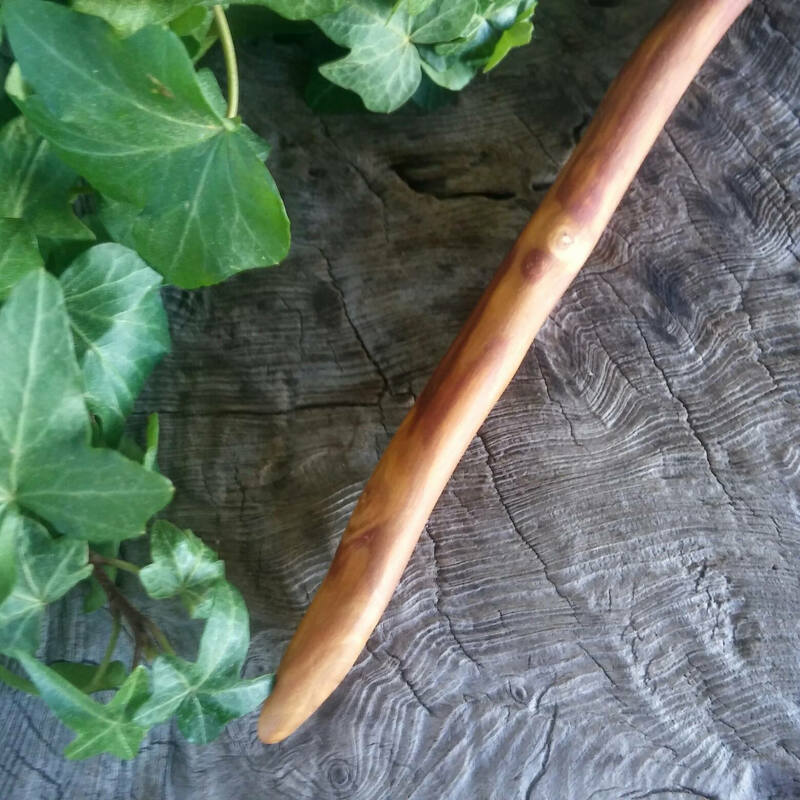 This wand is completely handmade, no machines, from beautiful apple wood. 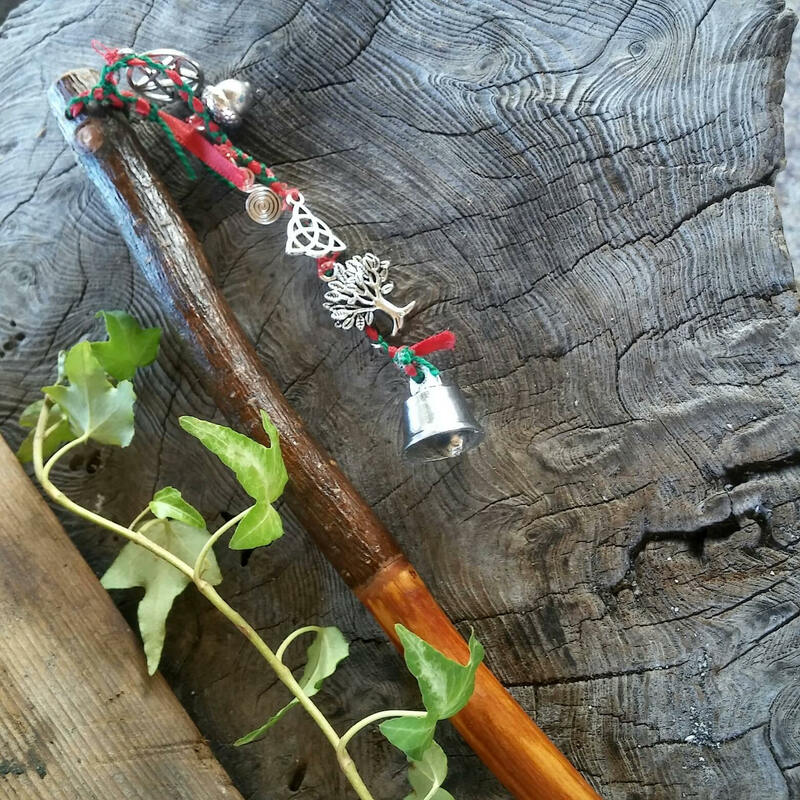 The sacred Druid plant, an t-uil-oc (Mistletoe), is often found on Apple trees, making it an especially holy tree to the Druids, along with the Oak. Apples and Apple trees are sacred to all forms of magick and witchcraft. The Apple Tree is closely linked to Druids in their aspect as magicians and shamans. 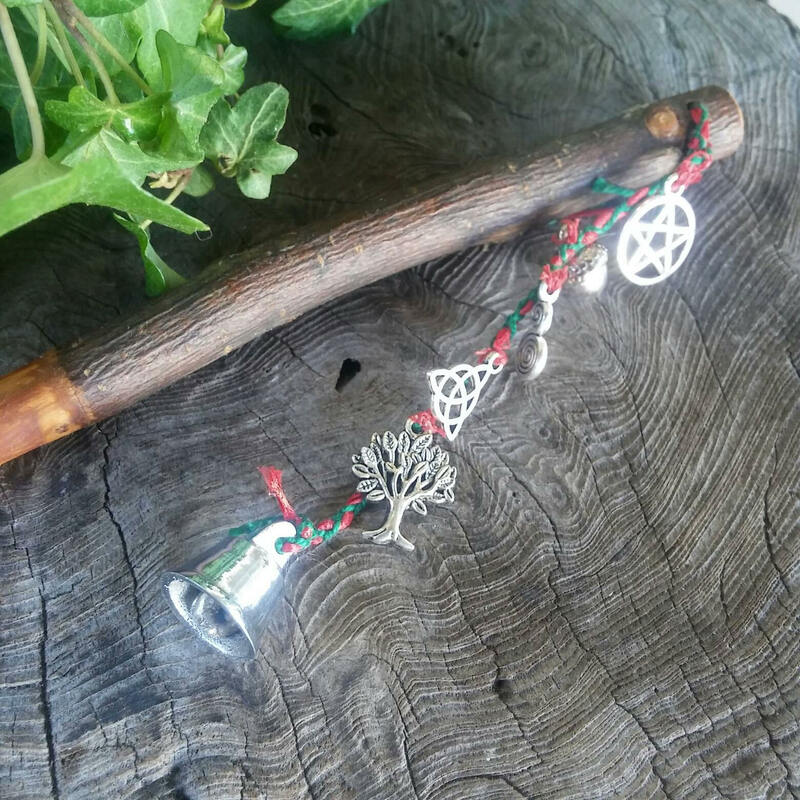 The tree is often used when the Druid undergoes a magical transformation or journeys in the Otherworld. In The Voyage of Bran, an Otherworldly woman appears with an apple branch laden with bells, entrancing Bran with wondrous tales of the Otherworld. So enraptured is he by this damsel with the magical apple branch, that he sets sail immediately for the enchanted shores, having epic adventures on his journey. Bards (poets) and Ovates (shamans) carried apple branches (with bronze, silver, or gold bells), called the Craobh Ciuil (Branch of Reason), as symbols of their ofﬁce. By now, you can see why the charms upon the red and green lash have been chosen. The pentagram represents the inside of the apple, if you cut it in half horizontally. The acorn represents the Oak tree and its sacredness as is the Apple to the Druids. The double spiral represents the Goddess. 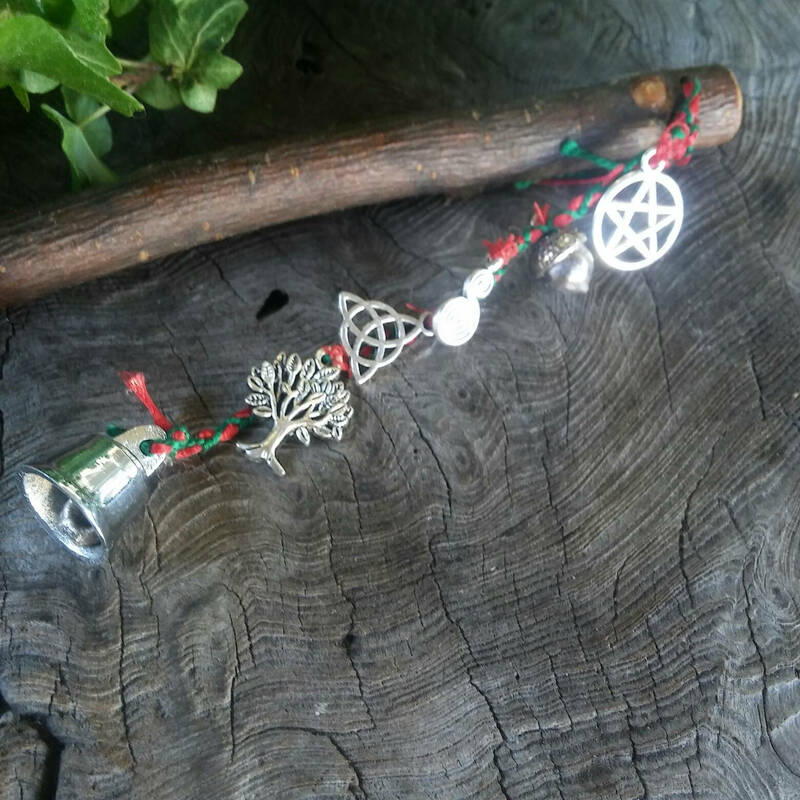 The triquetra represents the Celts, and the tree represents the Tree of Life as all trees are very life-giving and important to the Druids and Shamans. The bell is a nod to the Bards and Shamans. 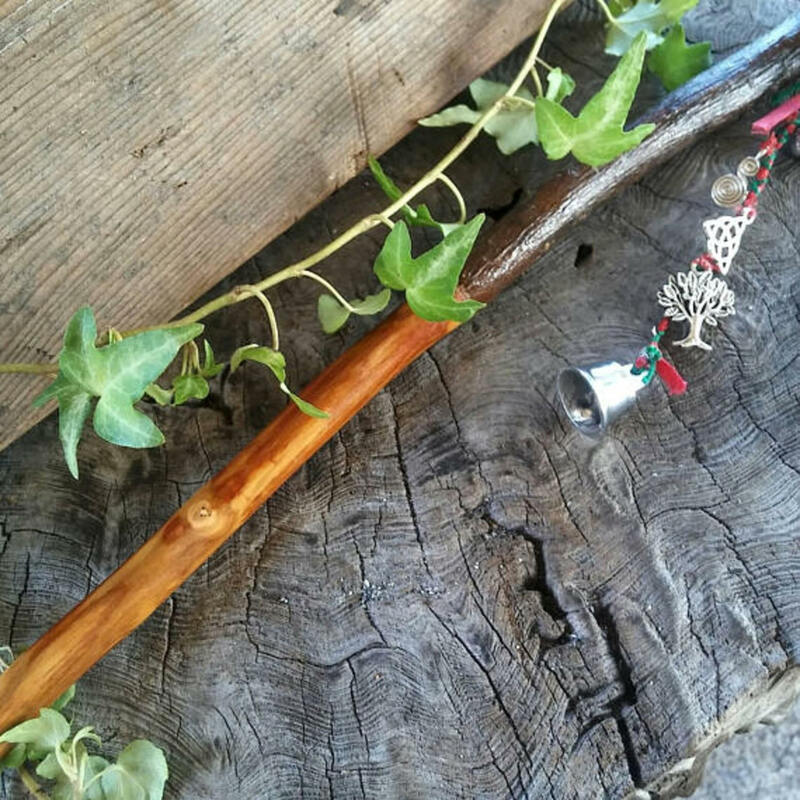 This wand is 11-5/8 inches long and the braided lash is 5 inches long from wand handle to end of bell. It is a wand of my own vision and not knowingly copied from any other and is my own intellectual property, all rights reserved. 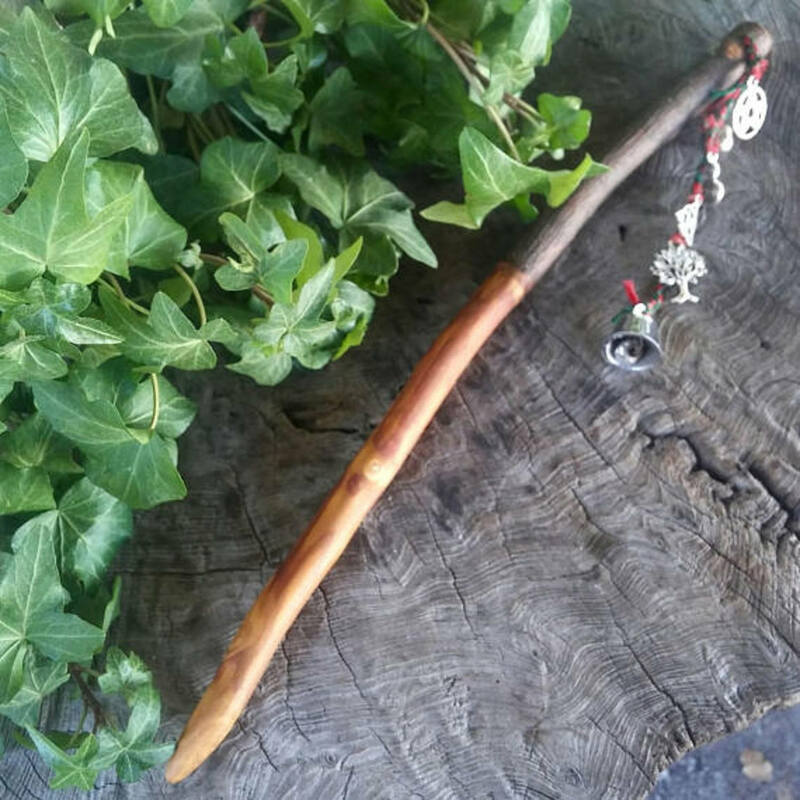 I have polished the wand with mineral oil and you will also be sent a 10ml pot of our own Speaking of Witch Wands Beeswax Wand Polish http://etsy.me/2r6Ewqn at no additional charge, for keeping the wood supple. 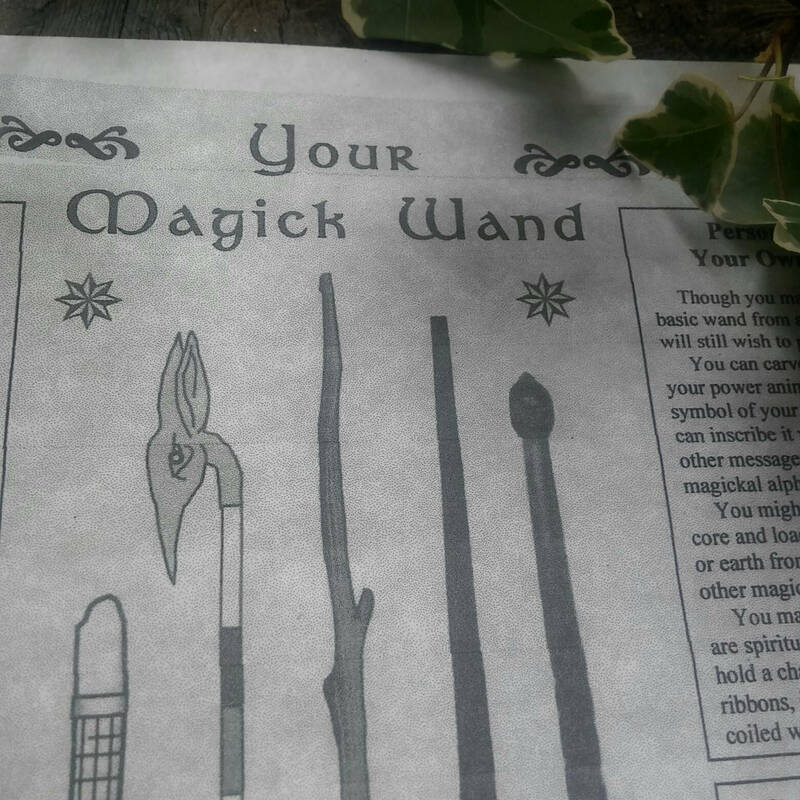 A Wand fact sheet on parchment giving information on consecration, types of, and history of wands is included. Free P&P within the continental US with tracking and insurance. Thank you for looking and many blessings!